Hair-wise, I am currently trying Elvital’s Fibralogy shampoo. It claims to thicken the hair by washing something into it. Wild guess: silicones. Either way, I’ve been trying it for about 3 weeks and so far I am surprised. It does build volume and body in my hair (to be fair my hair is a lot shorter than it was and thus holds volume better) without drying my locks out. On top of it all it doesn’t make my hair greasier either which is always a win. I will have to update you on my hair soon anyway, because chopping so much off has changed not necessarily products but the way I use them. More on that soon. My skin is finally getting better, some of that may be attributed to my new daily moisturizer. I’ve been using it for about 6 weeks to be sure it actually works for me, doesn’t break me out, etc. 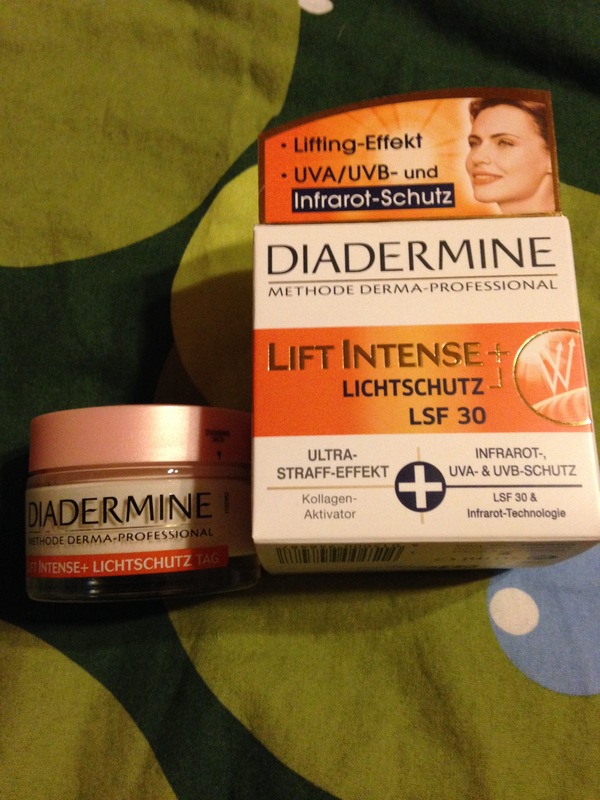 I am currently using the Diadermine Lift Intense+SPF. I did not choose this cream for its anti ageing properties but for the spf 30 it has in there. I am extremely fair and I was on the look out for a moisturizer that would give me at least spf 30 but wouldn’t feel sticky or greasy on my skin and make my foundation slide off. At first I was a little nervous to try it after I had seen the product’s buttery consistency. However, a little goes a long way and it melts upon touching it so you won’t have to scoop out all that much. It is just moisturizing enough for my dry/oily combo skin. On its own it gives my skin a healthy glow but I don’t produce any more extra oil than usually anyway. The cream has a certificate that says it is as hypoallergenic as humanly possible, it doesn’t break ME out but we all know that doesn’t mean anything. I can highly recommend it, though. It protects me from the sun, at least for a while and it doesn’t disturb my skin and at roughly 6€ it doesn’t break the bank. Other than that I am still playing with my nailpolish and make up organization, I also re-organized my DVDs with the result, that I’m still not happy. With either. Oh well, next week maybe. I finished watching Veronica Mars season 2 last week. 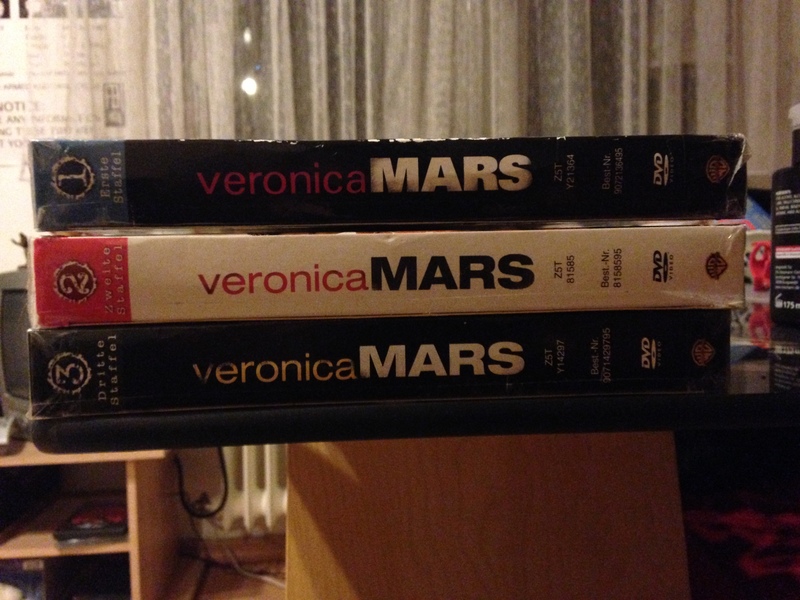 I’ve been a major Veronica Mars fan ever since the show started in Germany and along with fans all over the world I was upset over the cancellation, and like all these others I couldn’t give it a rest. After almost 10 years since the first Veronica Mars ep aired we succeeded, we funded the movie via Kickstarter and in 2 weeks the movie will start on the big screen and it will be available for download all over the world via iTunes etc. The perfect moment to re-watch the show for the nth time. I still LoVe it. I understand some popculture references better, but it has lost nothing of its charm, snark and still uplifting tendencies. I still want to be V in real life *sigh I am currently watching season 3, which is not as painful as it used to be now that we have the movie coming. I guess what I am saying is, if you like, and don’t know her yet, go check out Veronica Mars on YouTube, fall in LoVe with the show and go see the movie if you can. You will not regret it! That was that for my somewhat short Sunday Round Up. I hope you are all well and had a good week. Now, let’s get ready for a new productive, happy one.